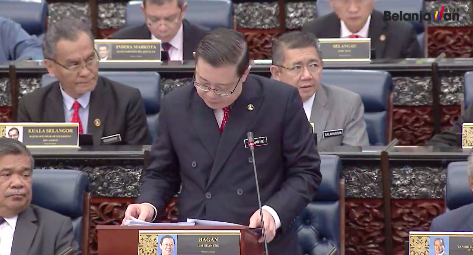 The theme of this budget is "Malaysia Wibawa, Ekonomi Dinamik, Rakyat Sejahtera" (A Resurgent Malaysia, A Dynamic Economy, A Prosperous Society). - Entrepreneurship culture across the country. This federal budget goes down in history for being the first tabled by a new government since 1957. Previously, New Straits Times reported Pakatan Harapan as assuring Malaysians that fixing the "mess" left behind by the Barisan Nasional administration will not be done at the people's expense. Petrol subsidies will be provided to car owners with engines under 1,500cc and motorcyclists with engines under 125cc. - 40 litres for a motorcycle. 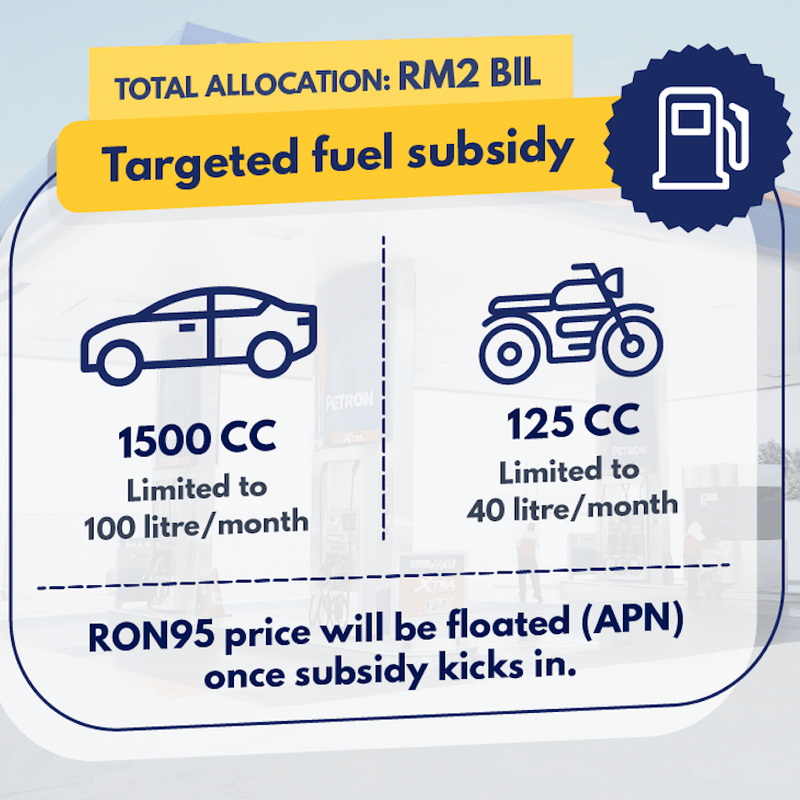 RM2 billion have been allocated for this subsidy. 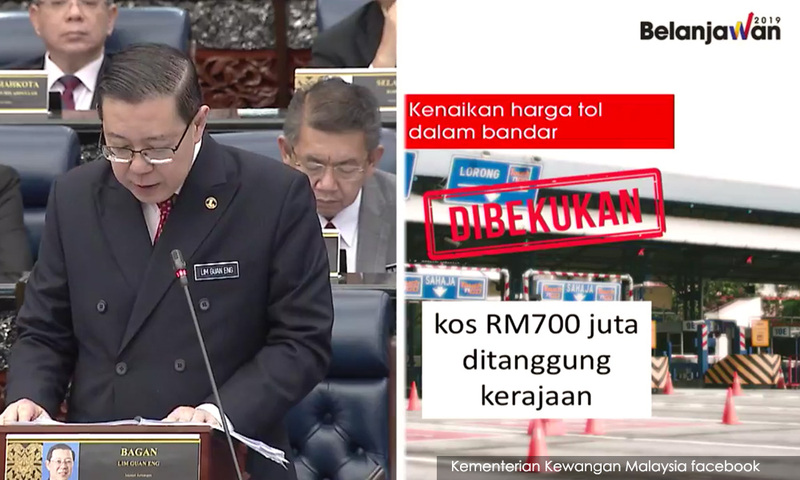 Intra-city toll rate hikes have been frozen following an allocation of RM700 million. Beginning January 2019, monthly passes of RM100 will be made available to public transportation users for unlimited trips on RapidKL rail or bus services. 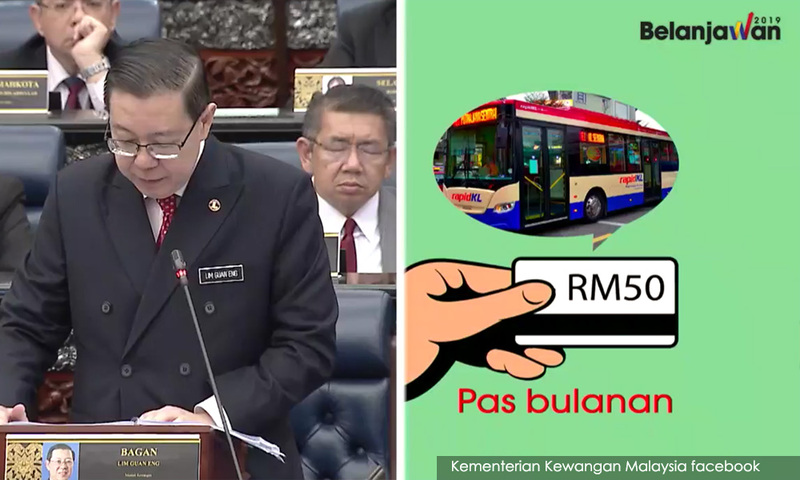 For bus users, RM50 monthly passes will be made available to them. This scheme will be extended to other bus companies in stages. For first-time home buyers in the private sector, the government has announced a "Peer-to-Peer Lending Scheme" to allow a "property crowdfunding" model regulated by the Securities Commission. For instance, a buyer may purchase a RM250,000 home by paying on RM50,000 while the balance is financed by investors through the scheme. The scheme is expected to be launched in the first quarter of 2019. 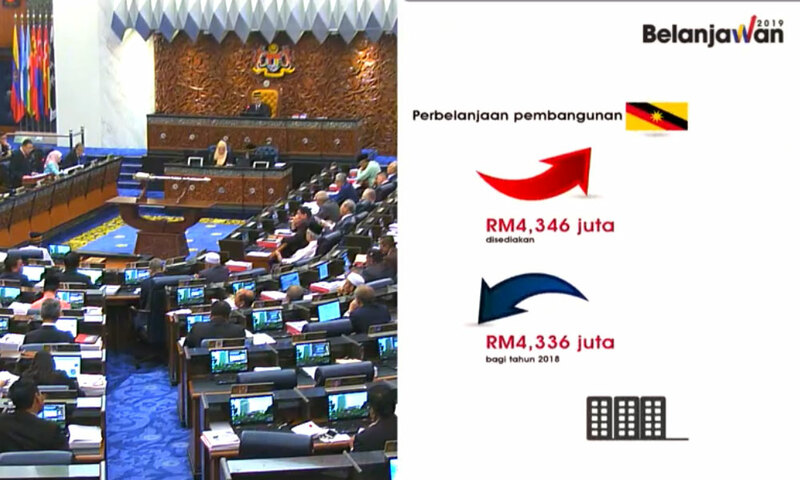 Meanwhile, the government has allocated RM1 billion to facilitate home ownership for the low-income group. The allocation goes to those earning under RM2,300 to own homes under RM150,000. 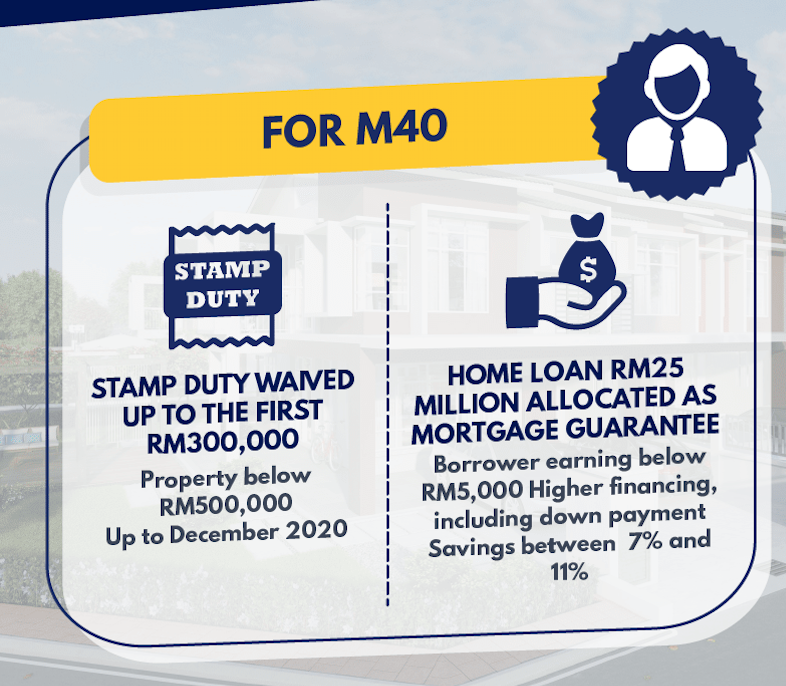 First-time buyers for houses up to RM500,000 will also be exempted from stamp duties until December 2020. Beginning 1 January 2019, families with a household income of under RM4,000 will get Bantuan Sara Hidup (BSH), the government's version of BR1M. - RM500 for income between RM3,001 and RM4,000. - RM35 million to build and improve infrastructure as well as install lights. Meanwhile, Sabah receives RM5 billion for development and Sarawak receives RM4.3 billion. - RM20 million for registered resident associations (community programmes, security). - Eligible pensioners (under RM1,000). Meanwhile, RM250 will be paid to all government pensioners. 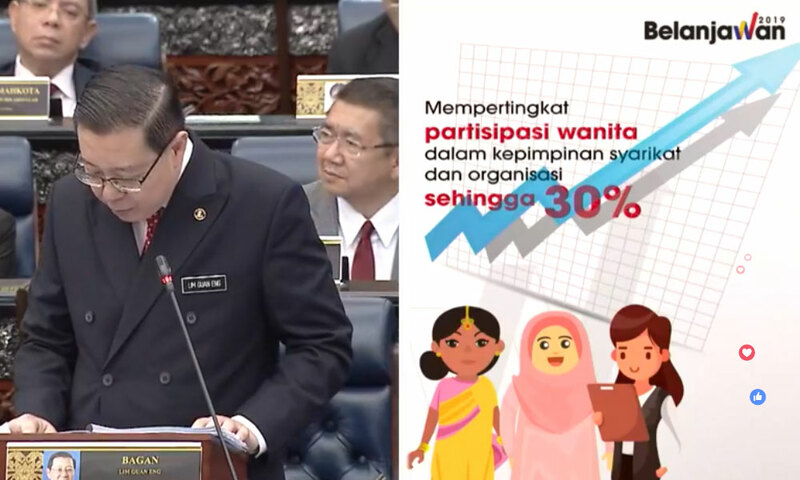 Lim confirmed that the minimum wage will be standardised at RM1,100 across the country beginning 1 January 2019. Moreover, Malaysians above the age of 60 who wish to work will have their mandatory EPF contributions reduced from 6% to 4%. Their income will also not deducted for EPF contributions to increase the money available to them. 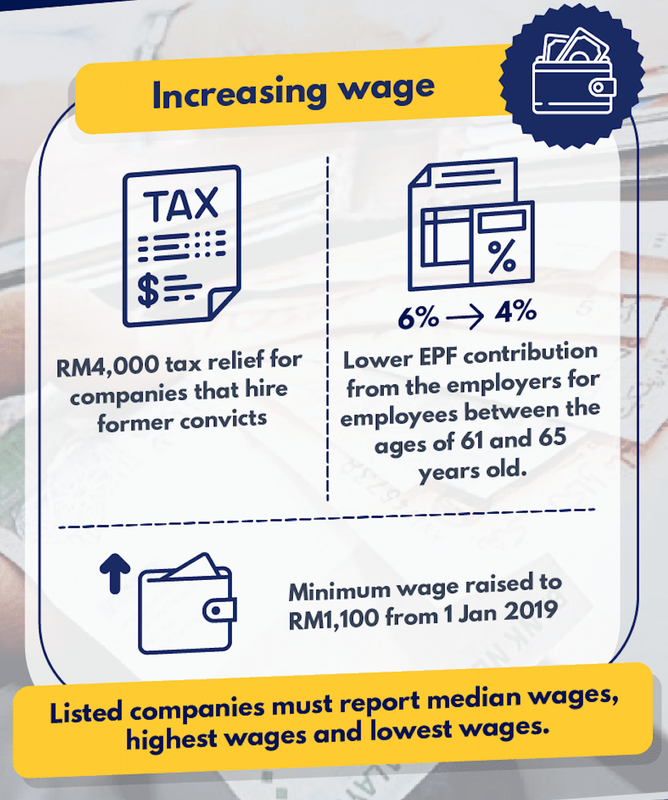 Companies that hire senior citizens with a monthly salary limit of RM4,000 will have tax incentives. 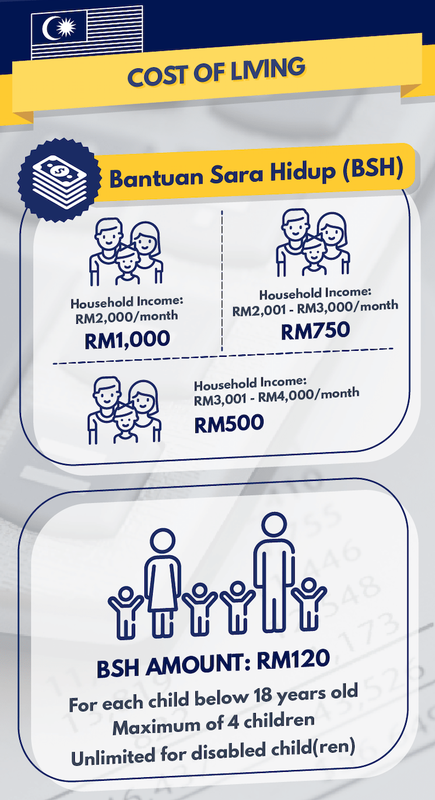 For PTPTN borrowers earning over RM1,000 per month, a payment system through deductions between 2% and 15% from the borrower's salary has been announced. Moreover, a tax break will be given to companies that aid their staff to settle PTPTN loans by the end of 2019. Individual income tax breaks under the National Education Saving Scheme has been increased to RM8,000. Meanwhile, the loans of borrowers aged above 60 with a monthly income of under RM4,000 have have been waived. 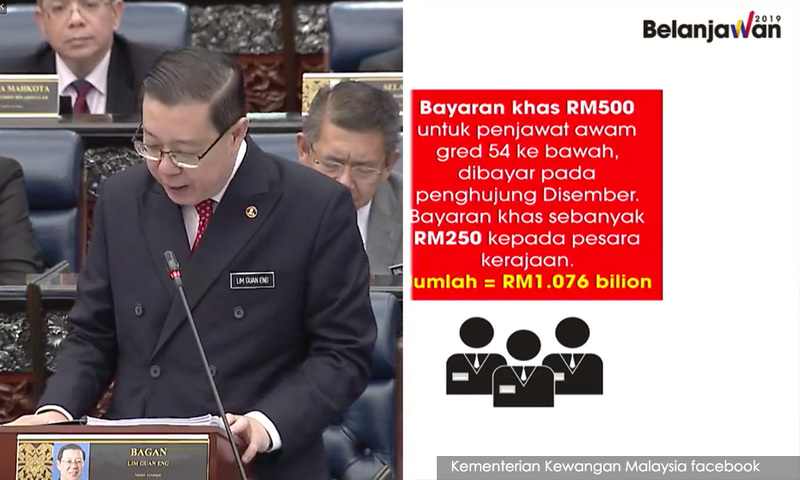 RM60.2 billion will be allocated to the Education Ministry, constituting 19.1% of the total amount for Budget 2019. - RM12 million for Chinese private secondary schools. Meanwhile, RM3.8 billion have been allocated for government scholarships, and RM400 million have been allocated for university research. Bumiputeras will be empowered with the RM210 million allocation for education and human capital development programmes. RM10 million have been allocated to encourage and develop e-sports. In collaboration with Great Eastern, the National Health Protection Fund will be launched for families in the B40 category. - Daily income replacement during hospital treatment for 14 days maximum at RM700 per year. Meanwhile, RM10 million have been allocated to extend medical benefits to parents of contractual civil servants. Those whose children contracted infectious diseases will be eligible for quarantine leave. 50 new childcare centres (TASKA) will be built at government offices following an allocation of RM10 million. The government will also continue to provide incentives for the private sector to give equal employment opportunities for women. The Finance Minister announced that the government aims to turn Malaysia into a smoke-free nation by 2025. Lim also reiterated the smoking ban imposed on all restaurants and eateries beginning 2019. It will be gazetted then. RM20 million have been allocated for the campaign, which was previously implemented during Prime Minister Tun Dr. Mahathir Mohamad's first stint in office. According to Lim, the campaign provides local manufacturers and service providers access to hypermarkets, shopping warehouses, and trade expos. Beginning 2020, imported services will be taxed to ensure that local service providers can become more competitive in the international market. According to Lim, these services will be required to register with the Customs Department. - Any form of digital advertising. SST exemptions will be granted to specific services provided by registered businesses to other registered businesses beginning 1 January 2019. A tax credit system will also be introduced for small manufacturers who purchase sources materials from importers and not registered factories. The government has raised the Real Property Gains Tax (RPGT) for locals from 0% to 5%. Exceptions will be made for homes under RM200,000. Meanwhile, companies and foreigners who are not permanent residents will face a 10% RPGT, and stamp duty for properties over RM1 million will be raised from 3% to 4%. All outgoing flights form Malaysia will be slapped with a levy beginning 1 June 2019. According to Lim, the government aims to encourage domestic travel with this move. - RM40 for flights to other countries. Beginning April 2019, an excise duty will be imposed on sugary drinks for RM0.40 per litre. - Fruit and vegetable juices with a sugar content exceeding 12g per 100ml. 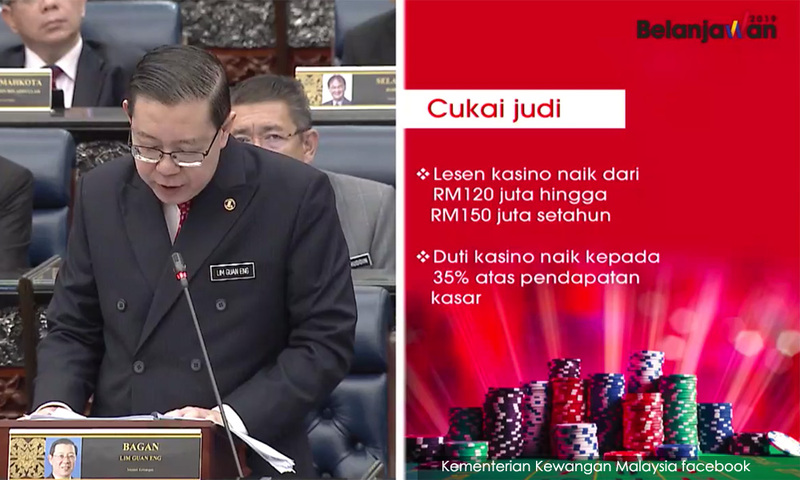 The license fee for casinos has been increased from RM120 million to RM150 million. Duties of casinos have also been increased to 35% of the gross income. Annual license fee for dealer machines has been increased from RM10,000 to RM50,000. The duty fee for it is increased from 20% to 30% of the gross income. Meanwhile, the number of special draws has been decreased by 50%. 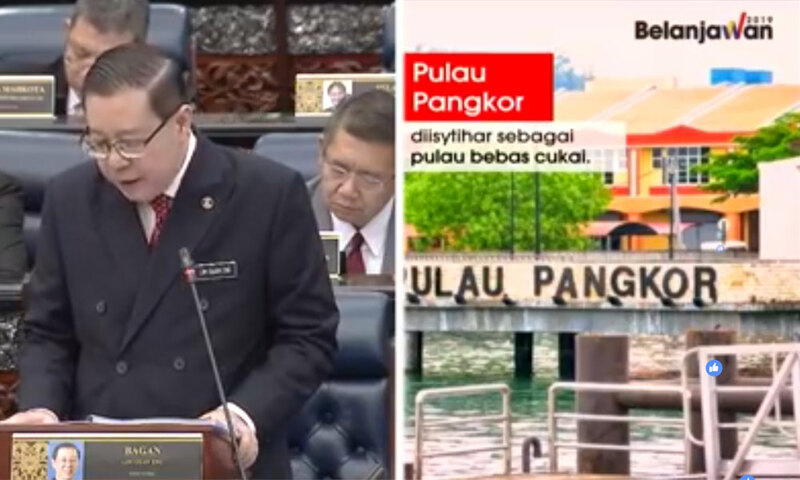 Lim said the island will be made duty-free to realise its potential as one of Malaysia's main tourism destinations. Nonetheless, the decision will be bound by certain conditions. Lim announced the National Fiberisation and Connectivity Plan, and expects 30 Mbps of broadband connectivity outside urban areas within five years of the plan's implementation. According to him, this plan portrays the government's commitment to digitising the country's economy. Meanwhile, broadband prices are expected to drop by 25% by the end of 2018. RM242.1 million have been allocated to MACC due to the need for recruitment. The agency will be hiring an additional 100 people. "MACC needs enough human resources to fight graft and money laundering in both public and private sectors, as well as to recover assets," Lim said. RM1.2 billion will be allocated to JAKIM in 2019, an increase from the RM1.1 billion in Budget 2018. Meanwhile, Muslim and non-Muslim civil servants are entitled to a one-off unrecorded leave of seven days to perform their respective religious obligations. You can refer to the full text of Budget 2019 here. What do you think about Budget 2019? Let us know in the comments below. Prime Minister Datuk Seri Najib Razak tabled #Budget2018 today. And Langkawi's status as a duty-free island will be further expanded. The government has also waived loans of those aged 60 years and above. Government pensioners will also receive RM250 by December 2018.